Producing unbeatable levels of sanitation throughout sporting facilities. From sports halls to canteens, swimming pools to shower rooms, Rotowash machines thoroughly and swiftly produce a level of cleanliness that thousands of customers across the UK continue to rely on for every surface in their sporting facility. 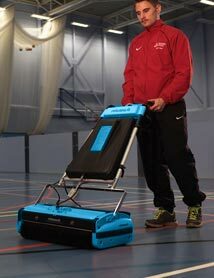 Rotowash is the #1 floor cleaning machine in sports and leisure facilities.